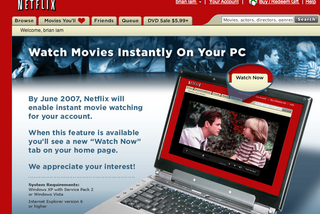 Click to viewNetflix will begin IP rental of films and television this week. Those with better plans get more hours, from 6 to 48 hours a month. Although limited in selection to about 1,000 titles and available initially to a few subscribers, this is the beginning of Netflix's main business plan to net rent video straight over IP that just wasn't technically feasible back when they started. It's limited to the PC right now, on XP and IE only. Over time, they plan to expand the service to the livingroom, and beyond. Quality depends on the users bandwidth, which can range from 1-3mbits, the higher equating to DVD quality. A stream can be watched in 10-15 seconds. The new service will rollout to about 250k users a month, as they scale up their delivery service to satisfy the entire Netflix user base of 6 million. That should happen, according to the website, by June. IP video livingroom solutions by Sony, Apple, Microsoft and all the cable providers are on their way or here. So, we'll see how fast Netflix jumps to the livingroom. Could be time for that Netflix Set Top box we asked for at xmas.